It is sad to have to have to acknowledge that the country of one’s birth is in decline, but there are signs that Great Britain has fallen on the slippery slope of moral deterioration. The recent surge in nationalistic jingoism and xenophobia in Britain is lamentable and obnoxious. On November 14 it was reported that the Mayor of London, Sadiq Khan, a civilised man who replaced the erratic Boris Johnson (now, heaven help us, Foreign Minister), said that some of his friends had been called ‘niggers’ and ‘Pakis’ and it is apparent that such racist abuse has greatly increased in recent months. In October the British Home Office reported that the number of racist hate crimes in the country had increased by 41 per cent in the month after the June referendum about UK’s membership of the European Union, the so-called ‘Brexit’ vote. The Equality and Human Rights Commission noted that «the figures make it very clear that some people used the referendum result to justify their deplorable views and promote intolerance and hatred» and there were other expressions of regret and revulsion — but not from many of the mainstream media outlets, because several newspapers rejoiced in the rush of intolerance that they had done so much to encourage. The reasons for lack of regret, alas, are that many Britons are inherently racist and most of the print media play on that appalling aspect of the British character in order to attract readers and make money. 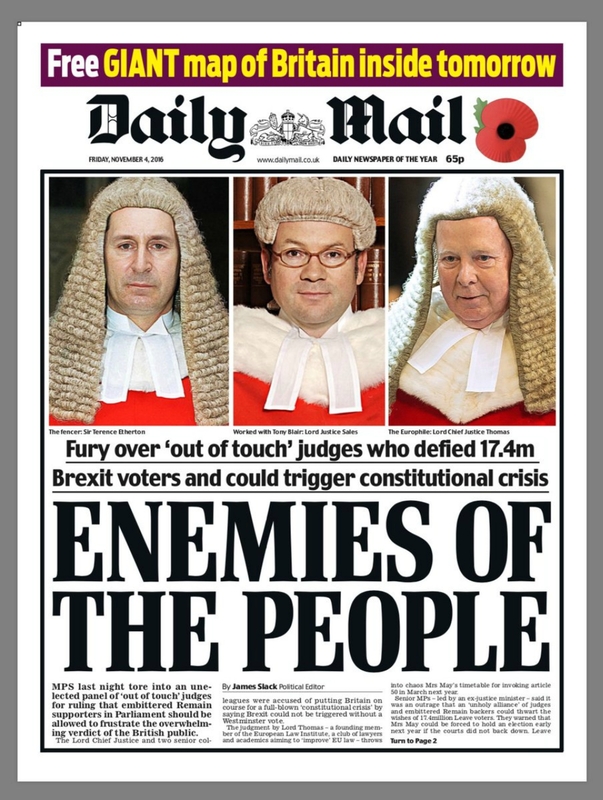 In the facile and attractive guise of patriotism the papers seize on instances of supposed non-Britishness to encourage their readers to engage in hatred and contempt of foreigners. It is unlikely that any writers of such fascist hokum are familiar with the works of one of the greatest English essayists, poets and moralists, Dr Samuel Johnson, who wrote so perceptively that «patriotism is the last refuge of a scoundrel». Britain has had a race problem for many years but of late it has become severe because of a spiteful nationalistic campaign to leave the European Union, an organisation that is bureaucratically absurd but seeks to benefit Europe’s citizens by promoting free trade and freedom of movement, protecting human rights, encouraging harmonisation of legal processes, increasing effectiveness of counter-terrorism cooperation, and promoting economic and social progress. The laws of Great Britain are determined by its members of Parliament. Many of both may be stupid, but no matter: Parliament is sovereign and its decisions are binding. Some of those who objected to the stance that the country should immediately leave the Union without Parliament discussing the matter took the matter to the High Court where three distinguished judges ruled that Parliament must vote on whether the country can begin the process. Then Britain’s media sprang into action. The Daily Mail, whose editor, the foul-mouthed vulgarian Paul Dacre, received «£88,000 in subsidies from the European Union for his country houses in Sussex and the Scottish Highlands in 2014» ordered his minions to produce one of the most disgusting front pages in the long history of British journalism. One declaration of President Barack Obama that will be remembered is his wise warning that in the United States «we are going to have to guard against a rise in a crude sort of nationalism, or ethnic identity or tribalism that is built around an US and a THEM». In Trump America it is possible that this crude nationalism might become dominant. But in Britain it seems it already rules. The ‘niggers’ and ‘Pakis’ and those judged (no irony intended) to be ‘different’ in any way to native Anglo-Saxons are considered to be undesirable. This has been so for very many years, unfortunately, and, as recollected by one young person so affected in the 1960s, it was insulting, when looking for lodgings, to «find notices galore that said ‘No Irish, no coloureds’». Although repulsive racist prejudice and casual bigotry are far from new in the United Kingdom, it had been thought that in the New Millennium there might have been some advance towards tolerance and acceptance of minorities. The Race Relations Act was supposed to eradicate racism, and had some mild success, but its aims have been set back or even destroyed by the bigots of Brexit who won their dubious victory largely because they appealed to all that is most base in mankind : the idea that superiority depends on race and especially colour.